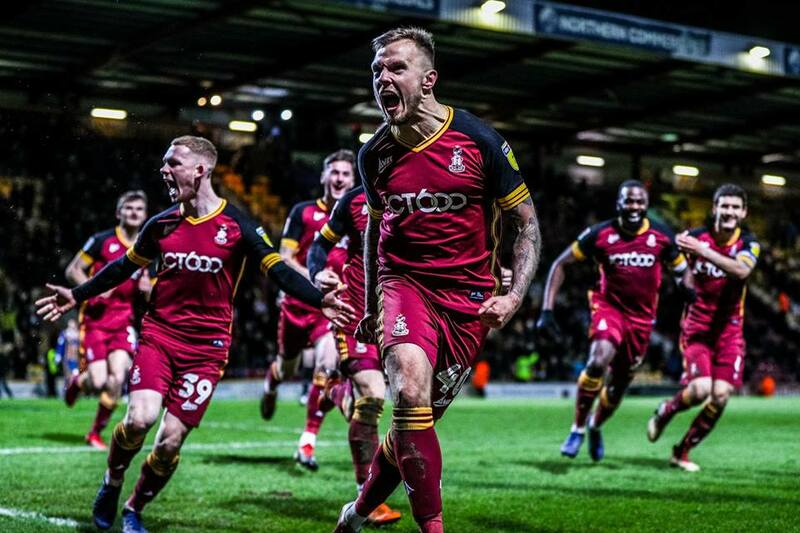 If Bradford City go onto survive relegation this season, it will be nights like this that will be looked back upon as absolutely pivotal. The Bantams had been in control against a lacklustre Shrewsbury, easing towards a fifth home league win in six, only for the visitors to recover a 3-1 deficit by levelling with a penalty in the 93rd minute. But then right in the final, final knockings of the game – a sixth minute of what had been originally announced as five minutes of injury time – David Ball collected Paudie O’Connor’s pass near the corner flag, cut inside and beat two players, before finding a suitable angle to bend a curling shot past Steve Arnold. Cue the celebrations. Unbridled joy, as supporters who had braved the cold leapt up and down in delight. Strangers hugging each other and high fives all round. Ball led the players’ hedonistic charge to the corner flag with a face of glee. It was a special, special goal in a campaign that has lacked happy occasions. The best moment of the season by far. David Ball richly deserved to be the match winner. He was the best player on the park by some distance, setting the tone right from the first whistle with a display of positive intent and bravery. He, Jack Payne and Lewis O’Brien were back to their swashbuckling best, performing without fear and revelling in linking up together to produce dazzling bits of football. Payne and O’Brien have received most of the plaudits over recent weeks, yet where would City be without Ball? He might not be the headline act, but his influence has been pivotal. Talks will continue over the next 48 hours to make his loan deal a permanent one. Had Ball not delivered his stoppage time moment of brilliance, the mood around the club would have remained downbeat. Results elsewhere were largely kind, and at 3-1 up City were on course to close the gap on several teams above them. To re-affirm their ability to get out of danger. Had they left the field only drawing 3-3, belief would have drained some more. They deserved the three points, but my goodness they made hard work of claiming them. City had started well, with Shrewsbury looking edgy and out of sorts in the opening 27 minutes. Jack Payne fired them ahead after a terrific through ball from Ball – coupled with intelligent off-the-ball running of O’Brien and Eoin Doyle, who freed up space to shoot from the angle. Anthony Grant attempted to stop Payne’s shot on the line but could only help it over. There is a claim it will go down as an own goal which seems harsh. Shrewsbury levelled out of nothing when the excellent Greg Docherty threaded a through ball to Feriji Okenabirhie, who finished smartly. That gave Town some belief and they became the better side for a brief period, but a superb finish from O’Brien and a second half stabbed effort from Doyle reasserted City’s authority. With half an hour to play, the home side were cruising. Okenabirhie would end the game a hat trick hero but on the losing side. His free kick with 14 minutes to play reduced the arrears, and some questionable in-game management from City in the closing stages – possession too often lost by taking risks to get a fourth – saw Paul Caddis concede a stoppage time penalty that was converted. In the midst of Ball’s euphoric celebrations, Caddis paused to say a prayer of thanks. He didn’t deserve to be the villain after another good display. Indeed it was an evening of strong City showings. Whilst conceding three goals demonstrates a frailty at the back still, Nathaniel Knight-Percival was in excellent form and new left back signing Calum Woods was very impressive. Woods had to go off early due to cramp which saw Adam Chicksen make a return after suspension. He was very effective linking up with Connor Wood, who grew into the game. Alongside O’Brien in the centre, Hope Akpan had another very good 90 minutes as he begins to finally show what he can do. Tonight Akpan did the ugly things really well, breaking up play and setting up attacks. It might not get the attention that other players’ performances are rightly getting, and not everyone seems to appreciate the ball winning role, but team mates certainly would have been quick to recognise Akpan’s vital part in the victory. In the end, winning in such dramatic style can only fuel self belief and confidence even further than if the players had seen out the 3-1 scoreline. Their character was rightly questioned of late, particularly after they folded in the last home game against Southend. But both at Burton on Saturday and now against Shrewsbury, the team have responded strongly to set backs. That can only bode very well for the future. In the press box after the game, the beaming smile on David Hopkin’s face said it all. He deserved it after some unfair criticism of late in some quarters. Saturday’s trip to a Wycombe side very strong at home looks tricky, but come away with at least a point, and the Bantams have two winnable home games. Momentum is back with them, and the joy taken from the stoppage time celebrations can bring everyone together once again. There’s still a long way to go in the fight for survival, but nights like this can go a long way towards making sure it is a battle that City ultimately win. Thanks for that. It wasn’t pleasant watching twitter early morning in sunny Australia. But two games four points since I went away in misery after Southend. Please let it continue. I am.firmly of the opinion as stated before that the fight to stay in league one wil go to the wire. The final day! Great write up Jason (as usual). Now the team ate starting to fire again, I hope Hopkin doesn’t’ decide to tinker with either the team or tactics for Wycombe. Like Barnsley earlier this month, this is a free hit for us. We’re not expected to get anything from the game, so let’s keep playing like we have over the last two games. If we bag a draw or even a win then its 1 or 3 bonus points gained. It’s proving difficult to win back the disenchanted fans, lost during the Rahic era. I know it was bitterly cold last night but I had to laugh at the official attendance figure. 14,000? Never in a million years! More like 8,000/9,000. It’s a shame the Rahic protest wasn’t brought to a head earlier. My worry is that a large proportion of the fans who drifted away are now lost. The financial consequences of this lost support will severely restrict our future progress. Rupp thought he was an investor and the thought of him being a charitable donor must be scaring the hell out of him. Currently, the off pitch situation worries me more than what’s happening on it. Steven J I totally agree with your fears. Jason is likely to also share the same sentiments but has a certain role to play, which if contravened may restrict the information he most admirably shares with us. Walking the fine line between keeping the fans informed and keeping his informant/confidantes happy is not easy. The truth is we owe certain fans a great debt of gratitude for the part they played in Edins `removal`!!! Jason played a `blinder` as did others who do not wish to be named. The Rahic protest could not be brought to an head quicker than it was and you could be advised to look at John Dewhirsts article in the latest City Gent, for the reasons for this. Others played a minor, but vital part. For my part I have trumpeted the loss in support as being Rahics final, and long lasting effect on our club. Irrespective of whether we play our football in league 1, o 2 how do you market next terms season tickets? Are we a club that is,at best set to tread water in League 1 (Many would take that now) or are we a club who are happy to slip back into League Two and become a big fish in a small pond? Or are we a club up for sale with an undetermined future?